Continuous availability architectures and processes are used by forward-thinking organizations that seek to ensure exceptionally high levels of service availability for mission- and business-critical applications. Two factors are driving this migration to continuous availability solutions. The first is the escalating demand for uninterrupted availability of key business applications, as consumers and markets have come to expect that services will be accessible anytime, from anywhere, without exception. In this context, the costs of even brief outages can be severe. The second driver is the shortcomings of conventional approaches to the availability challenge, which is to pair separate and distinct systems and processes for high availability and disaster recovery using N+1 designs. Following conventional approaches, critical applications are architected using N+1+1 designs, that is, they are built with a Need plus one spare methodology (+1, within a single site) and disaster recovery (+1 again across primary and backup sites). And typically since the spares are passive, some sort of failover or recovery operation needs to take place to bring the spare online resulting in needless downtime. Continuous availability is made possible by technology advances that make it feasible and economical to build and maintain multi-site active/active architectures for business applications. Rather than having costly resources idling in passive mode, continuous availability topologies efficiently “stretch” active assets across two or more sites. Two or more data centers deployed in active/active mode, each with a complete set of infrastructures that have no single point of failure. The sites need to be far enough apart to not both be impacted by a single disaster, but close enough to allow for synchronous data mirroring across sites. Depending on regional location, between 25 and 60 miles apart is ideal. 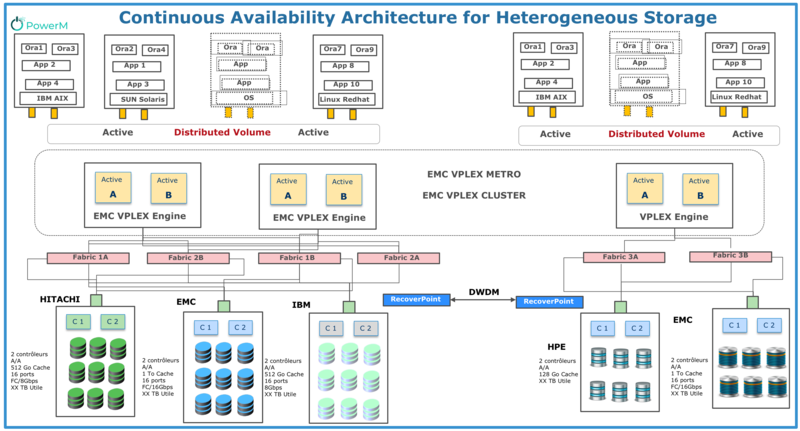 An advanced distributed data virtualization layer such as EMC VPLEX Metro to synchronously mirror and maintain data coherency across sites. Business applications architected to run in continuous availability mode using scale-out clustering with DB solutions like Oracle RAC or clustered file systems from VMware. Oracle RAC and VMware’s VMFS file system act as object brokers to enable coherent simultaneous updates to data that is read/write in both sites. A transaction distribution mechanism to balance transaction loads across the active/active sites during normal operations, and to route all traffic to the good site in the event that disaster or maintenance activity takes a site down. 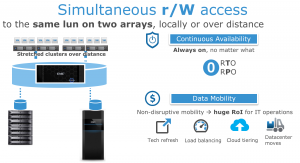 A consistent view of one or more LUNs between VPLEX clusters separated either by a few feet within a data center or across asynchronous RTT distances enables new models of high availability, workload mobility, and collaboration. Reduce replicated data over the network. The solution provides protection to applications in the face of disasters through automatic failover and failback between arrays and datacenters. Flexible Deployment: Data migration was done with minimum downtime, saving countless weekends of maintenance downtime and IT resources. Minimize network utilization with bandwidth compression and deduplication, significantly reducing replicated data over the network. Figure 3 : Use case configuration.